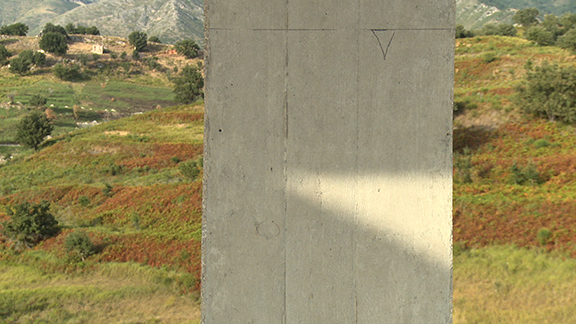 In a two-dimensional dystopian landscape of deserted half-built houses in Albania, a new mythology is in the making. The filmmakers, perhaps a contemporary incarnation of Goldilocks from the tale of the Three Bears, invade the houses and occupy their empty, liminal space and its missing furniture. The local community comments in song and speech about the new arrivals and their enterprise of an immigration in an opposite direction, from the full to the empty, from excess to lack. The work is shot is in abandoned private houses in ex-communist Albania, a country which remained untouched by western influence until the 1990s due to its totalitarian regime. 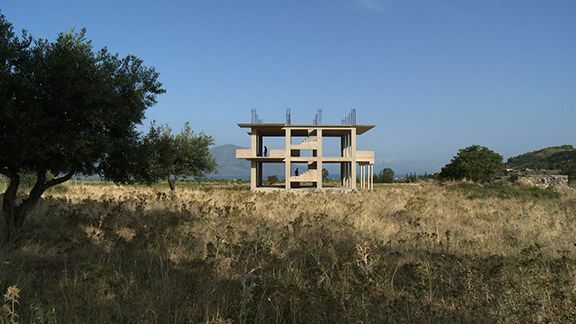 Since the change of regime and especially from the second half of the 90’s on, unfinished houses became an integral part of the Albanian landscape. It is a phenomenon typical to countries so called “in transition”, where mass immigration to European countries has been going on during now more than two decades. This visually striking phenomenon can be encountered in different degrees of intensity throughout the Balkan region, while in every area it has its own particularities and is revealing of specific local cultural, societal and historical issues. In the Albanian case, if not in all cases, it is a phenomenon strongly related to emigration, as these houses are built with money sent back home by people who left the country. They are usually destined to be inhabited by these same emigrants, and their construction is often abandoned, for good or for long periods as the ex-patriated stop sending money due to financial difficulties in their host countries or simply because they drop the idea of return. The frozen un-finished houses, placeholders of ‘home’ are left then suspended between past and future, a construction and a ruin, an idea and its concretisation, the perfect transitory site. 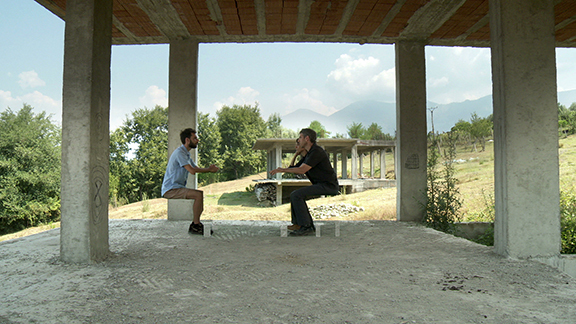 The work’s text, sung and spoken, is based on a series of interviews we have conducted in Albania in May 2014. The questions we have asked were about our plan to immigrate to Albania (which was a real plan, at that stage). Questions such as why, in your opinion, we would like to immigrate to Albania? What do you have that we don’t? What do we miss in Belgium? What will we miss once we live in Albania? The answers to the questions are the textual data base of the work. They have served as an inspiration to Krenar Zejno, a poet from Tirana, from whom we have commissioned 4 poems written in the format of traditional iso-polyphonic songs, and where also the base for the spoken dialogues. Iso-polyphony is an old form of narration, of transmission, and moreover, of myth-making, that operated in the Albanian society until the 1990’s, end of the communist regime. Throughout the centuries, while respecting its own very rigid rules, the Iso Polyphony managed to stay flexible and dynamic in order to keep its non official role of cultural heritage transmitter. It is the voice of society, a way of forming a collective identity, of sharing experiences and reworking the misfortunes and agonies. The film’s structure is inspired by a rather occidental source, the story of Goldilocks and the Three Bears, a tale of intrusion that we have very loosely adapted to the work’s pre-assumptions. From Goldilocks we borrowed the three (non)-furniture that mark the sequentiality of our occupation: the chair, the table and the bed. Housewarming, 2016 -excerpt from effi and amir on Vimeo.